Did You Help Pick Milkweed Floss? Don’t cut your milkweeds in fields and along roadsides. Let them grow to maturity so the pods can be picked for war purposes. This is the message to Illinois and Indiana farmers from Dr. W. I. DeWees of Illinois State Normal university, Normal, Ill., and O. C. Lee, Purdue University, Lafayette, Ind., newly appointed directors of the project in their respective states. “We expect to work this program in Illinois through the schools of the state, especially the rural schools,” said Dr. DeWees. Considered a nuisance and a pest by many stockmen and farmers because it infests fields and pastures DeWees pointed out, the milkweed is now supplying a vital war need so important that the War Food Administration and the U. S. Department of Agriculture, with the cooperation of other government agencies, are organizing to collect the seed pod of this weed in 26 states during the coming late summer and fall. The silky seed fibers of the milkweed have been found to be highly waterproof and buoyant. Department of Agriculture officials point out that with supplies of kapok cut off by the war, milkweed floss is now the best material available for use in life jackets, and that floss collected this summer may save many lives in naval operations on seas through the world. Minimum needs for this year have been estimated at 1,500,000 pounds. Collection campaign for milkweed floss will be directed from Petosky, Mich., where a plant had been built to process the floss. In the various states which are to collect floss, WFA will have cooperation of 4-H club leaders and members, state experiment station directors and staffs, state educational organizations and state and county war boards. Bags for shipping the pods will be furnished to 4-H club members, Boy Scouts and other children who will assist in making the collections. Twenty cents per bag will be paid for picking the pods. Collection of the milkweed pods will not begin until late summer. Preliminary organization work has already been completed, however, since many of the children could best be reached through the schools before the start of summer vacation. 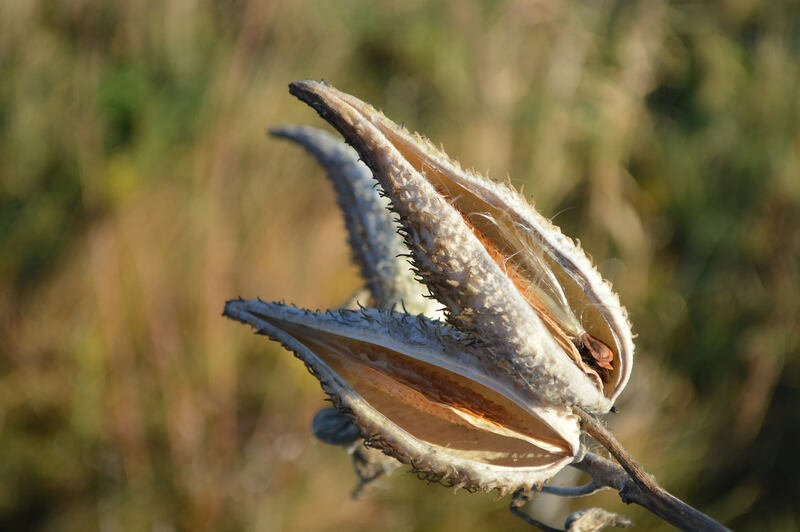 The children are being asked to be on the alert during the summer to locate areas with heavy stands of milkweed, so that every pod possible may be harvested in the fall for its war important fiber. The boys and girls who will help are being instructed to begin picking any time after the milkweed seeds begin to turn brown. This will be sometime in early September in most states. The pods will be picked into 50-pound open-mesh onion bags holding about 800 pods or roughly one bushel when properly filled. Officials in charge of the campaign advise that filled bags be hung to dry over a well-exposed fence where there is plenty of sun and wind. Milkweed pods thus handled will be ready for shipping in from two to five weeks. Dew, rain, or snow will not harm the pods of floss if the bags are hung on the fence at least a foot off the ground. They will mold and spoil within a few hours if in contact with the ground or a damp floor, or if they are contained in a tight box or sack. PHOTO CAPTION: [Pictures did not reproduce well.] Boy Scouts, above, show method of picking milkweed pods. The pod is picked entire, it is pointed out, and no effort should be made to remove floss from the pod at this time. Standard open mesh onion bags will be provided free to those who wish to pick milkweed when the project gets under way in Illinois about Sept. 1. Lower photo, milkweed floss is baled in the factory established at Petosky, Mich., last year. For many years the United States has used kapok fiber in life jackets but capture of the East Indies by the Japanese suddenly cut off this supply. Milkweed floss has been shown to be a satisfactory substitute for the imported kapok.